How many ninjas were mind blown during One-Eyed Doll’s beautifully chaotic inspirational set at The Gathering of the Juggalos 2016 in Thornville, Ohio and wanted to support the two-piece Austin, Texas Gothic band at their merch table, but ran outta cash before hand and still couldn’t afterwards because of stacked bills?! Well, we have great news for you! 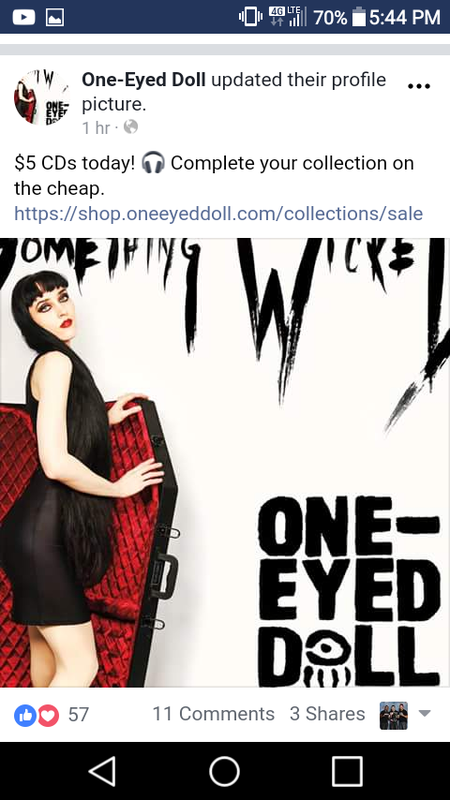 One-Eyed Doll just announced across Social Media that their official online store will be selling 5 dollars CD’s for 24 hours only! Whoa! What OED/KF CDs are missing from your collection? We’re doing a 1 day $5 sale for all of our CDs at our shop. If you’re missing any CDs, today is the day to get them! Free shipping worldwide at $100.We also only have about 30 copies of the original Hole, and we’re never ordering them again. So if you want that version, get it now.